Congratulations to Jack Nicklaus & Tom Watson! Mahalo! On behalf of all of us at Wailea Resort, our sincere appreciation to the many people without whom this legendary event would not have been possible. Wailea Resort has been the proud host of this stellar tournament for seven years. We extend our warmest mahalo and aloha to the great pros, Wendy's and other sponsors, ESPN, The Champions Tour, our resort employees and many loyal guests. The Wendy's Champions Skins Game will continue to call Maui home, at Kaanapali. Be sure to tune in again for another great tournament. 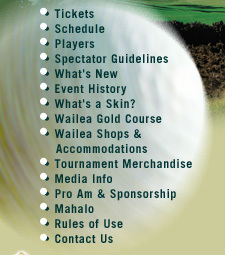 And, be sure to visit www.waileagolf.com for news about other great events at the Wailea Golf Club. Sanctioned by the Champions Tour. Photo credits: Hale Irwin: ©2005 Steve Grayson/WireImage.com. Raymond Floyd: ©2005 Al Messerschmidt/WireImage.com. Gary Player: ©2004 Stan Badz/PGA TOUR/WireImage.com. Peter Jacobsen: ©2005 Gregory Shamus/WireImage.com. Dana Quigley: ©2005 Allan Campbell/WireImage.com. Tom Watson: ©2003 Stan Badz/PGA TOUR. All other tournament images by Ray Mains & Associates Photography. Photos of golf professionals in this website are of previous and/or potential tournament participants, and do not in any way indicate whether these individuals will or will not be playing in the tournament(s). © 2000-2007 Wailea Golf LLC. All rights reserved. Website designed by Carolyn Quan / Dream World Media.